Every January, San Antonio gyms overflow with new members. These folks are committing themselves to that New Year’s resolution to get in shape. Sadly, by March many of these same folks have forgotten about that resolution and the gym membership has lapsed. The usual excuses crop up: not enough time, not enough motivation and just plain bored by the whole gym scene. What is unfortunate is that we all need exercise to stay healthy. How we get that exercise shouldn’t be a deterrent. That’s why many homeowners have discovered the many benefits of having an in-home gym. It’s hard to come up with an excuse not to exercise when all you have to do is merely walk down the hallway or into the garage. 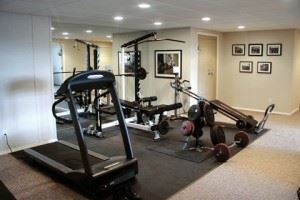 Having a gym in your San Antonio home might seem like an extravagance but in reality it’s no different than any other room in your home with a purpose. In your family or living room, you’ll watch television. What would you need for that? Sofa, chairs, coffee table and of course that television. Along with TV you might add in a Blu-Ray player and surround sound system. You gave this room a purpose. Now, take that same attitude and apply it to a spare room or garage in your home. The purpose is an exercise room. First, you’ll have to clear out the junk that might have built up in that space. That’s easy especially when you call upon the services of a professional team of junk haulers like Junk King San Antonio. One call to this crew and you’ll be able to get all the clutter removed from your home. Once you’ve reclaimed the space, you could start out your home gym with a simple piece of cardio equipment like a stationary bike. Here’s a helpful hint. Add a television to your exercise room. You spend at least a half an hour watching TV every day. Why not watch your favorite program while working out. Before you know it, the show will be over and you’ll have burned off a bunch of calories. Depending on the space, you can add to your exercise bike by bringing in some free weights. Here is where that TV will come in handy when you can hook up a DVD player and pop in some exercise programs to follow. This is your own space and you won’t be in competition with anyone else to get at the exercise equipment. Another benefit of putting this exercise room goes back to the idea of hiring the top San Antonio junk haulers. While you’re clearing out your exercise space, you can also take advantage of those pro Junk King movers to get rid of all the junk inside and outside of your home. As long as they are brining over a big empty truck, why not fill it up with all those items you’ve been wanting to get rid of? Get a jump on your New Year’s resolution and open up your own personal gym before New Year’s. This entry was posted in san antonio hauling, San Antonio Junk Pickup, San Antonio Junk Removal and tagged get rid of junk san antonio, San Antonio Home Gym, San Antonio Junk Hauling, San Antonio Professional Hauling on November 30, 2011 by Mike Hasselbalch. Last updated August 2, 2017 .